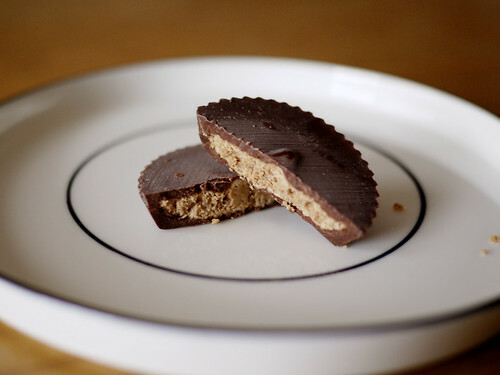 I love Reese's Peanut Butter cups but processed candy bars tend to be rough on those of us intolerant of lactose. So when I came across Justin's organic dark chocolate peanut butter cups at Jack's the other morning, I couldn't really resist. Especially when the ingredients are so straightforward. M. felt like the peanut butter interior got a bit lost but I was quite happy with this organic alternative. Hi there! Thank you so much for posting! It looks like the PB filling might be a little dry - we had an issue with a batch getting dry from rapid temperature changes. If you send us an email to comments@justinsnutbutter.com we'd love to send you some replacement cups! Let us know, and thanks again for your post!